"Use your grill to give the mahi mahi a lovely smokey aroma. The red pepper and cilantro pesto adds color and texture to this flavorful dish. Try serving with yellow rice or sugar snap peas for an amazing meal. You could easily adapt this recipe for other types of fish like snapper or swordfish." Place the wine and shallot in a saucepan over medium-high heat. Bring the mixture to a boil, then reduce the heat to medium-low and reduce the liquid down by about half, about 4 minutes. Remove from heat and set aside. Place the Parmesan cheese, garlic, and walnuts into a food processor; process until finely chopped. Add the olive oil, cilantro, and 1/8 teaspoon black pepper; process until smooth. Remove the cilantro pesto from the food processor and set aside. Place the red peppers into the food processor, pour in the wine reduction, and process until smooth. Pour the entire mixture back into the saucepan and bring to a boil over medium-high heat. Reduce the heat to medium and simmer the sauce for 4 minutes. Meanwhile, season both sides of the mahi mahi fillets with salt and pepper. Cook the mahi mahi on the preheated grill until the fish is golden and flakes easily with a fork, about 4 minutes per side. Whisk the butter, 1/8 teaspoon black pepper, and 1/4 teaspoon salt into the red pepper sauce until smooth. 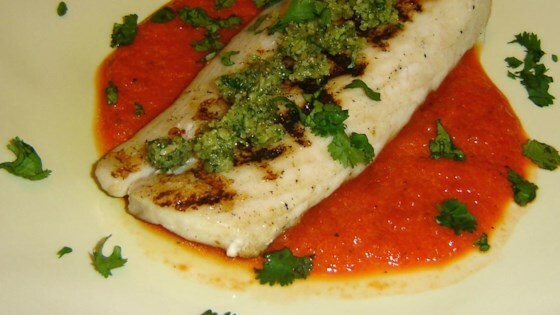 Spoon the red pepper sauce onto the bottom of the serving plate, arrange the fish on the sauce, and top with the cilantro pesto to serve. See how to make a quick Thai-influenced fish dish on the grill. I made this for my hubby as he is the only one in our house that enjoys mahi mahi. He said if he could he would rate it a 10. I followed the directions to a "T". I hope everyone enjoys this dish! If anyone could submit a photo, I would really appreciate it, thanks! This was fantastic!! Added a little more salt to the roasted pepper sauce but everything else was right on!! Will definitely make again!